My co-worker came back from having a break in our dining area at 3:00a.m. He told the charge nurse that he was approached by one of the inmate workers who served food to staff. He vented out about his frustrations regarding his physical problems that he felt was getting more severe. I glanced at the name on the chart and realized I saw him earlier this month. I volunteered to see him so that way, I would know if he was truly weaker somewhere. Coming through the Clinic’s door, he walked with the usual slight limp on the right leg [He had been claiming he had a stroke when he was 28 yrs. Old. But the last CT scan was negative]. Otherwise, I didn’t see any weakness or any signs of distress. When I was asking him some questions, he started getting teary-eyed and some tears finally flowed during my interrogation. “But nothing is happening. I feel that the doctor is not doing anything. I think I am weaker on my right side. Can I have a job change or maybe not even work in the kitchen?” [as tears started falling this time]. “Yes, I don’t know why.” [eyes turned more red and more tears fell]. Aren’t we all like him? We tend to focus on our problems, needs, worries, fears and anxieties, instead of focusing on Jesus, ONLY on Jesus. Sometimes, we think God doesn’t care for us when our prayers are not answered. We think He’s too busy to listen to our pleas. He is not interested with our requests. Have we forgotten that if God created this complex universe, won’t He be able to be involved with the many, many lives He created in the first place? When we focus on Jesus, we will not be distracted with the cares of this world. Our faith will keep on growing. Our trusts will be stronger knowing that His promises made to us are worth-remembering. God doesn’t change. [“Jesus Christ is the same yesterday, today, and forever,” –Hebrews 13:8]. When we focus on Jesus, we believe that everything is under His control. It’s not enough that we just believe that He can handle our problems, but we must also believe that He knows what’s best for us, even if the answers do not seem to go with what we are hoping for. 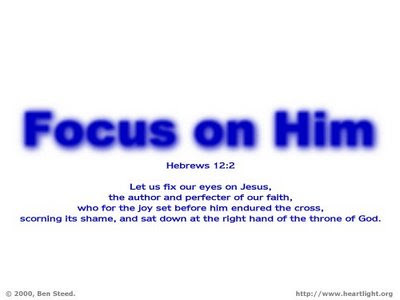 So, let us “focus on Jesus”. All posts/composed songs copyright by RCUBEs. 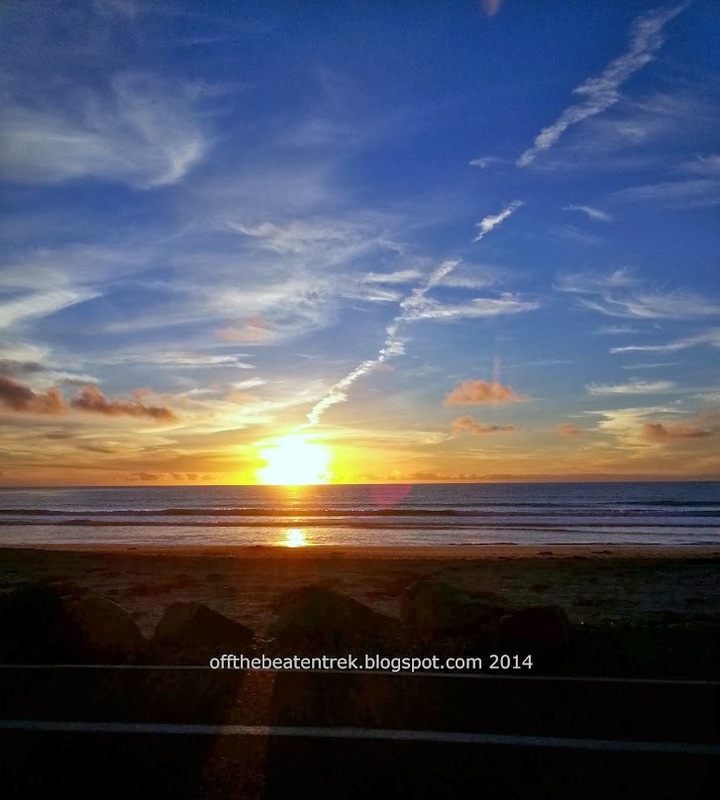 Check Out My Daughter's Blog!! Do we BEG God for healing? Pam asks, "Where Is the Right Church? Does One Exist?" We Are Healed by Your Sacrifice Lord! The sun was just peeking from the Eastern skies. Out in the prison’s yard, some huge Sheriff’s buses were illuminated by the soft glow coming from the lights all over from the tall lamp posts. Their engines were turned on, warming up, before the buses would take the inmates to the different courts where they would have their trials. Orange-uniformed men were lined up in pairs, joined together with handcuffs and chained, forming a long line. They already had their breakfast and had their morning medications prior to going to courts. Some were fidgeting, as they waited to board those buses. All of a sudden, all hell broke loose! Two men were engaged in a fight, using weapons they made secretly for a while. Deputies called for help on the radio, both for custody back-up and medical staff, as well. When the air was cleared and the other inmates were secured, one man was down on the floor. He sustained multiple gashes but two of them were deep. One cut was vertically etched from his left ear going down to the jaw line. The other dangerous cut was horizontal on his left neck, close to the jugular vein. Pool of blood dripped all over the floor. Holding his bleeding neck, he was pointing at the other inmate few feet away, being guarded by the other deputies. The other man being accused was not hurt. There were no lacerations nor any other signs of trauma. He was obviously very agitated as he was being questioned by those deputies, while the medical staff started treating the other man on the floor. They cleaned the wounds and controlled the bleeding. That man was sent to the nearby hospital. When the investigation was finalized, it turned out to be that the “downed man who was accusing the other inmate” was the attacker and the other one who didn’t have injury was the one attacked. The deputies found out that it was the second attempt to attack the unhurt man. Both attacks on him failed. He was well-prepared after the first attempt on him, that when the second attempt was done, he was able to defend himself and ended up injuring his attacker severely. We also have an “accuser of the brethren.” Satan and his army of demons are the enemies of God and of everything good. Because of what Jesus had done [dying on the cross], we, who live in constant fear of death shouldn’t be afraid anymore. Jesus had freed us from that fear so we can live for Him. When we belong to God, we know that death is only the portal that leads into “eternal life”. [“Thank You Lord!]. Paul warned us, too that we also battle against the evil forces of Satan, who is a vicious fighter. But to be able to withstand their attacks, we must depend on God’s strength and use every piece of His armor. We face an army whose goal is to defeat Christ’s church. When we believe in Christ, they become our enemies. They will try any device to turn us away from the Lord. Fear not! For God has provided His supernatural power to defeat Satan and his army, through His Holy Spirit within us. So, arm yourselves with God’s armor. Let us be strong in the Lord's mighty power. Let's put on His whole armor to resist the enemy's attacks: put on the sturdy belt of truth and the body armor of God's righteousness. For shoes, put on the peace that comes from the Good News, so that we are well-prepared. We will need faith in every battle as our shield to stop the fiery arrows aimed by Satan and his army. Let us put on salvation as our helmet, not forgetting the sword of the Spirit, which is the Word of God. Let's pray at all times, on every occasion in the power of the Holy Spirit. We must stay alert and be persistent in our prayers for all Christians everywhere. [Ephesians 6:10-18]. The Train Known As "The Beast"